As St. Patrick's Day rolls around, you may be thinking about enjoying a great Irish Beer. With so many available, How do you choose? Well, hopefully this lens will help you out. The first thing I would like to emphasize is just because it is green does not make it Irish. 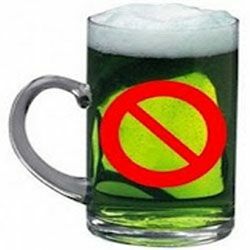 So this year, just say NO to that green beer and try an authentic Irish Beer. I have broken everything down to make it as easy as possible to get the information on Irish Beers you need with an explanation of each type of Irish beer, as well as a description of the taste and flavor. Now one thing to keep in mind is that you may be thinking, that you really don't care for those heavy stouts, like Guinness. However, I am going to show you the many ways to drink a stout which you will absolutely love. 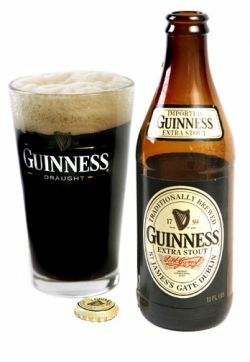 So, please if you have the opportunity to try a stout on St. Patrick's day or whenever, why not close your eyes and take a sip, allow your taste buds take in the rich flavors. There are basically two types of beer: Ales and Lagers. Smithwick's Irish Ale is a very old beer and its origins date back to the 13th century. Quite an interesting history behind the brewing of this fine beer. It is a rags to riches tale of the Smithwick Family. When the odds are all stacked up against you, the one who succeeds is the one with the most passion for what they do. The Smithwick's truly earned their excellent reputation, as they are one of the major ale producers in Ireland today. This is a very clear beer with a rich ruby color and a creamy head. The taste of Smithwick's Ale is slightly bitter, with a roast coffee flavor and a hint of caramel. This is an excellent Ale. 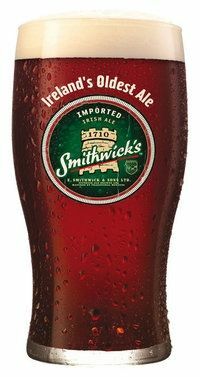 If you have never tried Smithwick's, you will want to add it to your list to try. Smithwicks Beer Logo New White T-Shirt Size " S, M ,L , XL , 2XL , 3XL "
Stout beers are part of the ale family. They are dense and dark, and you might notice a hint of chocolate on your palate. Stouts are brewed from a base of roasted malt. Originally known as West India Porter or Extra Superior Porter, The Extra Stout's beginnings date back to the 18th century. Extra means more malt and more bite. Exactly what we think of when we think of Guinness. The Foreign Extra Stout was released in the U.S. in 2010. The anticipated Guinness Stout's counterpart boosted a 7.2 per cent alcohol by volume. Either way, Guinness is a true classic. The first taste brings a smoothness and sweetness with a slight bitterness to the tongue. It took me years to appreciate the dark chocolate, rich coffee notes this beer delivers. 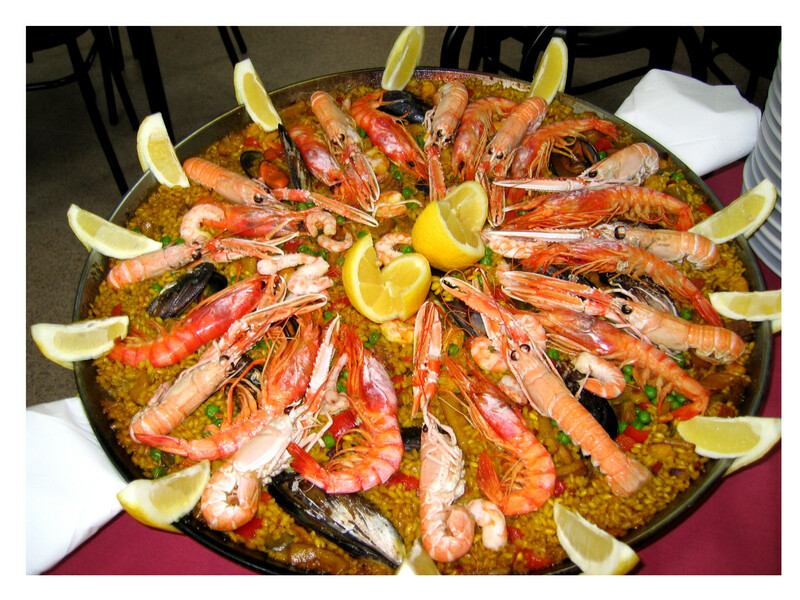 There are many recipes which use Guinness Stouts rich flavor to enhance foods. The two which come to mind are Guinness Cake and Guinness Stew. 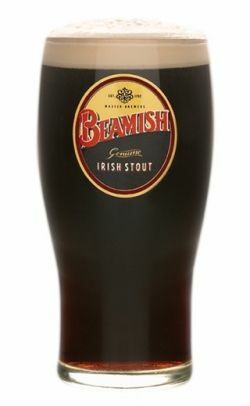 Beamish Stout is often compared to Guinness. While Beamish is dark and chocolaty like its more famous cousin, it features a slightly lighter body and a spicier bite. Beamish Stout goes through a two-week brewing process using the original Beamish yeast, which dates back to 1792. Beamish comes in a nitro-can to simulate the taste and texture of a freshly-poured pint for a result that is truly bittersweet. Nicely rich roasted malt taste, a little smokey with just the right hint of coffee and a touch of chocolate. Beamish has a thinner body, yet is very creamy. This is one beer which goes down very easy, sometimes too easy. It is an excellent beer and one you will most likely want to taste. The tap style of Guinness Draught is by far the most popular. Served up in pubs and restaurants around the world, it is the most beautiful looking glass of beer, with its two-tone white creamy head and black beer base. Popularly coined, "The milkshake of beers", this meal in a bottle has that roasted malt flavor and hint of chocolate. A rich and creamy Irish favorite for centuries. Ask your bartender for a "perfect pint," an optimal pouring method to create the fluffy white cloud at the top of your Guinness. In regards to taste, it is full-bodied, yet incredibly smooth with just the slightest hint of caramel and chocolate. Isn't time you move over to the dark side and try a Guinness? Warning, this may put hair on your chest. The art of perfection. This video has got to be the sexiest beer advertisement I have ever seen. And the star is Guinness. The black beer is ever so skillfully poured into a glass creating the Perfect Pint of Guinness. 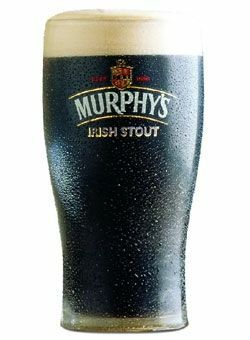 Murphy's Stout is the lightest and sweetest of the Irish trio (Guinness, Beamish and Murphy's). You can definitely drink more of Murphy's then the others, they just go down so easy and taste like chocolate milk. Well not exactly but more so then the others. Murphy's is the "good kid" on the block. Murphy's has been acquired by Heineken in 1983 and is one of the fastest growing stout brands in the world. Think chocolate milk topped with a double shot of espresso and finished with a one-inch thick head of caramel-infused creamy goodness. Awwww...This is one delicious beer, why not have the Guinness with dinner and save this one for dessert. Carlow Brewery began in 1996 in a small town in Ireland known as Carlow located in the historic Barrow Valley region. This region was once home to many thriving small beer crafters. In or around the 1800's, crafting your own beer was quite common. However, this all ended with the takeover of small breweries by big business. Carlow Brewery still brews with these old fashion standards and believes their way is the best way. I guess you can say Carlow Brewery is old school. Organic in nature with no artificial flavors or colors, this beer is a definite winner. Velvety smooth with robust coffee and chocolate malt flavors cutting through the texture. 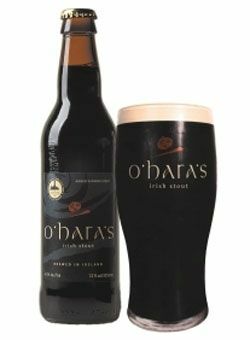 O'Hara's Celtic Stout is true to the original Irish stout. No artificial additives, just hops, barley, yeast and water, that's it. Really makes you wonder what's in all those other beers your drinking. To sum things up Ohara's Celtic Stout is the real deal. The word "Lager" comes from the German word "lagern" meaning to store. Lagers are made from the bottom or cold fermenting yeast. The brewing time can take up to a month or more but results in a typically light-colored fruity brew with a mild hop flavor and strong carbonation. Not everyone wants a milkshake beer . Luckily for them, there's hope - Harp. 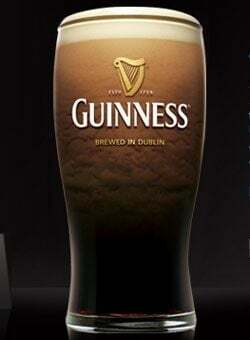 This second-most-recognizable Irish brand is frequently co-marketed in the US with Guinness-US packaging employs the same harp logo for both, and the two are often combined in the same glass to form a Black and Tan. The beer was originally produced by The Great Northern Brewery in Dundalk. 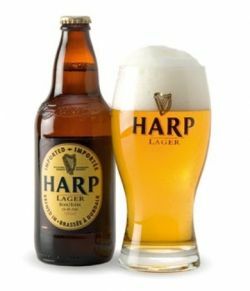 Ireland first produced Harp Lager in 1960 and it was later taken over by Courage, Barclay & Simonds, Scottish & Newcastle, Bass, Mitchells, & Butlers and Guinness breweries. More bitter then in American-styled lagers, but the low malt presence and strong carbonation make this seltzer-ish take on lager. This classic pale lager is smooth and fresh with an unexpected aroma of hops which turns into a crisp dry flavor that balances the rich and grainy malt base. Extremely refreshing and easy to drink. Harp Lager Beer Logo New White T-Shirt Size " S "
Kinsale has a rich brewing tradition which is like many small towns in Ireland. Kinsale's dates back to the 17th century, when European explorers headed to the New World. Apparently they would stop in for a pint at what used to be known as Lander's Malt House. Some of the explorers who have passed through are Sir Walter Raleigh and Alexander Selkirk, better known as Robinson Crusoe. The Kinsale Brewery Company acquired the space in 1997, and in 2001 Kinsale Brewery opened. Taste the tradition" is Kinsale's motto, and we can certainly see why. Golden yellow in color with a fast-fading bitter start, highly carbonated, with light touch of floral and malt. Kinsale Irish is crafted from the finest natural ingredients and aged to perfection. No chemicals, no preservatives, and no gimmicks- just the only Irish lager actually brewed in Ireland! 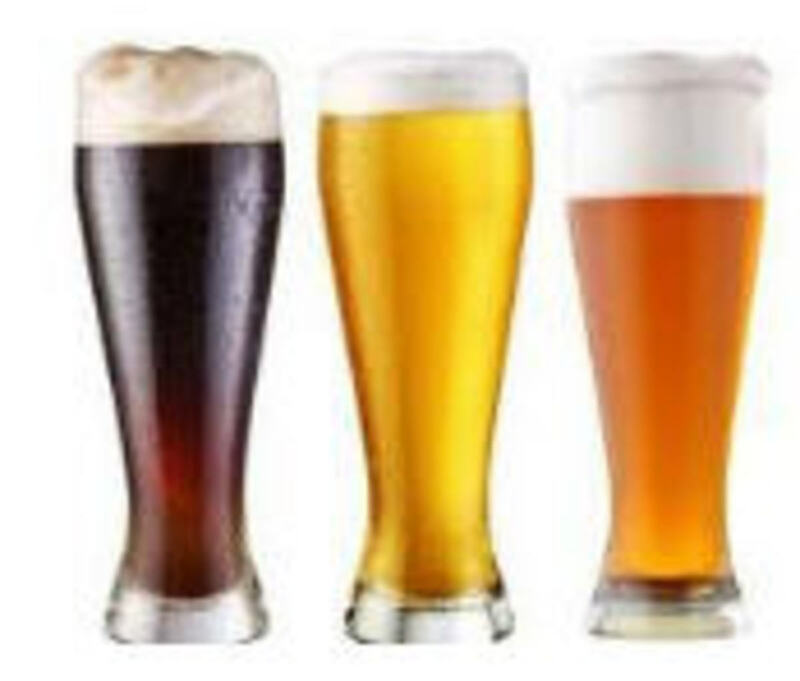 Ales are created from top-fermenting yeast in warmer temperatures. The fermenting of an Ale only takes about 7 days. Ales generally lack carbonation. 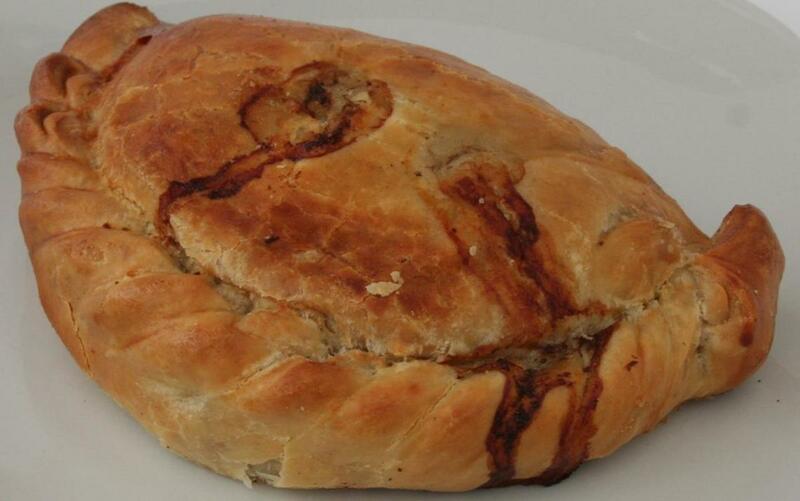 They are stronger and more forceful in taste than lagers and are traditionally served at room temperature in England. Murphy's Irish Red was first brewed in Lady's Well Brewery, Cork in 1856. Lady's Well, located across from the company's brewery in Cork, has been a religious site for Catholics since the eighteenth century. Irish red ales get their reddish color from the roasted barley they contain. Some manufacturers artificially add red color to their beers, and as a result some beers labeled "red ales" are not truly so. In America, darker amber ales are also sometimes labeled as "red ales." Heineken purchased the brewery in 1983 and is produced in Heineken, Nederland. 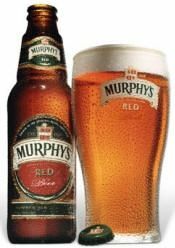 Murphy's is also known as Irish Amber and Draught Irish Ale. This true Irish red is dry, crisp and slighty carbonated with some signs of fruit and caramel. It has a medium, rocky head. There is just the faintest hint of hops at the end. This beer is wonderfully drinkable. I just discovered this beer this weekend. It is a terrific beer and is available in the U.S. The bottle cap is a really cool design and has a ring which you pull to remove the cap, no bottle opener required. Sometimes, it's the little things in life which are important. A bit of history, Porterhouse Brewery began in 1989, when Liam La Hart and Oliver Hughes bought a run-down building in Bray, which became the original Porterhouse. They ran the bar with a strict philosophy, that all beers sold had to be made in "traditional' ways to create a more organic product than mass-market beverages". So if you are in Dublin, stop by and visit the Porterhouse try some of their fine beers. At last an Irish Red Ale with a traditional hop flavor to balance the fruit character of the yeast and the luscious caramel flavor notes delivered from the malts used, as opposed to artificially added. Cream Ale is actually a combination of an Ale and a Lager. Basically it's ale yeast fermented cold. Cream Ale colors range from amber to red. They are creamy smooth and well-rounded with a hint of hops. This beer is older than some countries, with a heritage dating back to the fourteenth century, and until recently, Dubliner Pub in Washington, D.C. was the only place in the United States that carried it. 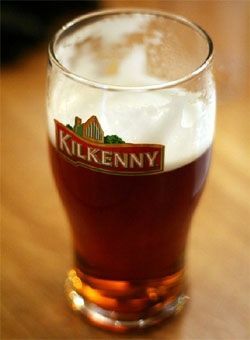 Kilkenny has since become widely available. Kilkenny was originally brewed in Smithwick's brewery. The taste can be described as Smithwick's with less hops and a creamy head like Guinness. Currently it is brewed by Guinness. A distinctively smooth and flavorful ale, it's sweet, yet creamy, offset by some bitterness with a deep red hue and a rich, velvety smooth head. Kilkenny Irish Cream Ale is light and ultra smooth with over 50% less carbonation than regular beer. With less gas, it is less filling. Irish Beer Gift Baskets contain only the best Irish beers from brands that are cherished the world over. These Irish beer baskets are authentic Irish beer gifts that represent the best of the Emerald Isle. Inside they'll find Guinness Extra Stout, Magners Irish Cider, Harp Lager, Killian's Irish Red, Smithwick's Irish Ale, and the king of them all, Guinness Draught. This guide is a must have for the Guinness Collector. The iconic toucan and the slogan `Guinness is good for you' are universally recognizable, and much-loved symbols of not only the famous stout, but also of good old fashioned, fun loving Irishness. From beer mats to clocks, posters to dinky cars, there are a huge number of items all bearing the Guinness logo and image which enjoy increasing value and popularity with international collectors. Guinness floated on top of Bass Ale. The beers stay separate, so you get a darker flavor when you start sipping and a lighter one when you down the last drop. Some folks also like the symbolism: For a change, the Irish (beer) ends up on top of the English. 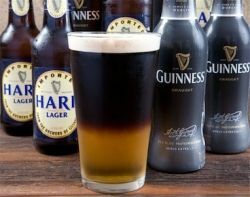 Black and Tan is not a traditional Irish drink. Hold the pint glass at an angle, and fill just over halfway with Bass Ale of Harps Lager - on tap. Slow the flow control on the Draught Guinness tap down to a trickle. Fill to the top, letting Draught Guinness hit the side of the glass. Guinness on top of Harp. For a crisper finish. Beer mixed with hard cider. As usual, the Guinness will float on top. The mix of bitter and sweet is simply luscious. Beer and lemonade. Like a Snakebite, but with less alcohol. Guinness and champagne. Hey, it's supposed to be a celebration, right? And leave the food coloring in the kitchen. Do you like Chocolate Milk, then you will love this. While many of these are not truly an Irish tradition, they are an alternative way to enjoy Ireland's number one best selling beer. A word of caution, I would not recommend ordering these in an Irish Pub. You will be greeted with either a smile or a black eye. Now you can brew in style and/or save money by purchasing kegs as opposed to bottles/cans. If you are in the market for a Kegerator, stop looking. These commercial quality kegerators feature a sleek stainless steel design, dual regulators, and an industry best temperature control. With dual regulators and a top rated temperature controller to guarantee best in class performance you can't go wrong. Rock the green this year with some tasteful St. Patrick's Day Makeup ideas. Do you like comfort foods? 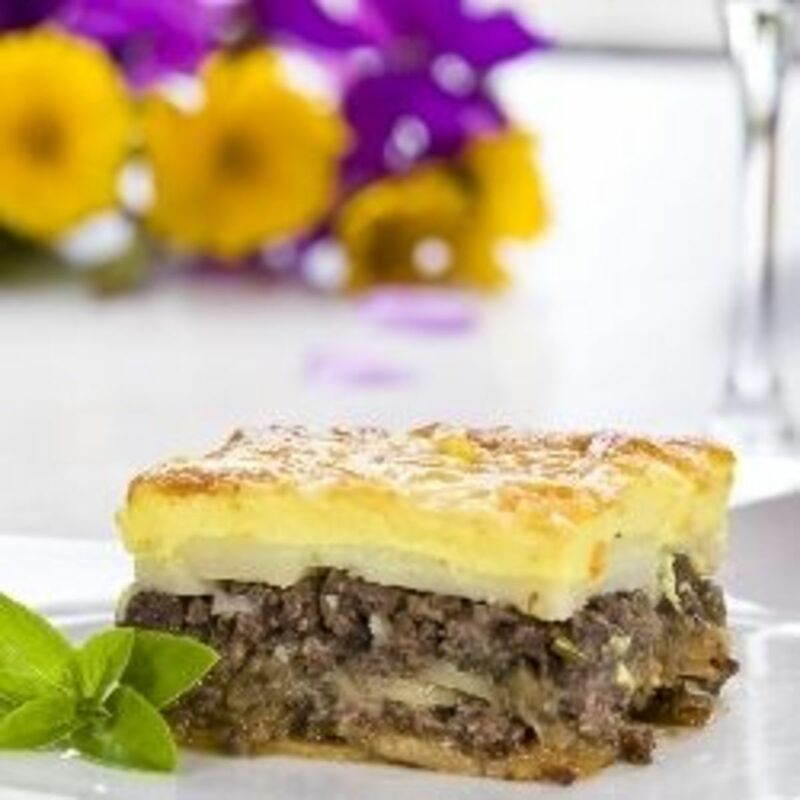 Then you will love these traditional Irish recipes. They are the king of all comfort foods starring the all mighty potato. Guinness in Cake? Yes that is correct. Did you know that Guinness Stout has a hint of chocolate so it is a perfect choice to enhance a chocolate cake. What is St. Patrick's Day without Guinness? Well you have to try this Irish treasure in an Irish Stew. Easy Crock-Pot Recipe for Corned Beef and Cabbage. Remember Corned Beef and Cabbage, it's not just for St. Patrick's Day. I hope you enjoyed this lens on Irish Beers. I hope you have learned something new, but most importantly that you will forgo the green beer this year and opt for an authentic Irish Beer. Please take a moment and rate my lens. Thanks again. Happy St. Patrick's Day. Ireland's Guinness Stout - World Favorite! Kenny was the poison of choice at our local haunt in University, love that stuff. Great variety of beers with the classics and lesser known pours. Great lens! I love beer - thanks for sharing this! @Scarlettohairy: I like mine cold too! :) Thanks for visiting. Yum! Love beer but I do like it cold. I might have to visit Ireland and try a room temperature beer to see. Great lens thanks for sharing. love that guinness. WooHOOO ... what's not to love about a beer lens? Well, now I've got a craving! Thanks for sharing! Blessed by a SquidAngel! Great tips for selecting the right Irish beer; green just does not make every beer Irish. I could go for anything dark and rich now! Yum! A good Guinness is hard to beat, so get ready to bend the elbow next week! Saint Patrick's Day is coming! This lens has really put me in a St. Patrick's Day mood. Great job! Appreciating this topic for St. Patrick's Day coming up. Conversations helps with new ideas. Hey I just won 100 points tonight. Wow . THanks. Blimey, but it will soon be a time to hoist a good Irish beer! I totally learned something about Irish beer and will opt to drink an authentic Irish beer this St. Pattys Day. The Snakebite sounds like something I would enjoy. 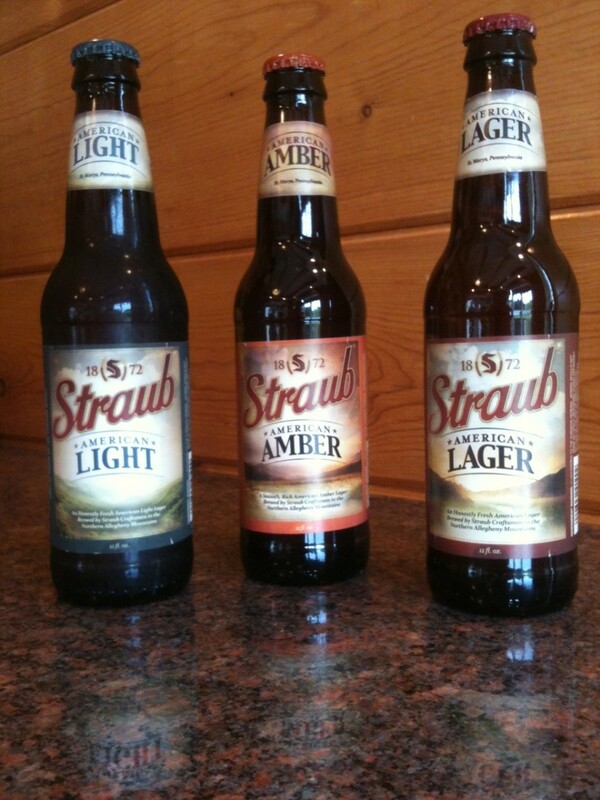 I prefer a lager or black and tan over a true stout. Luckily for me, in Irish south Boston it's easy to find real Irish brews - in fact, it's easy to find really great draft beer in most of New England, where we are fortunate to have Irish beer lovers, Irish bars and thousands of microbreweries. Slainte! St Patrick's Day is coming up again. I would imagine Irish Beer gets even more popular then. .